Description: The Striper's upper body is blueish to dark olive, and its sides and belly are silvery. Seven or eight black, narrow stripes extend lengthwise from the back of the head to the base of the tail. Size: Stripers live up to 40 years and can reach 100 pounds, though fish larger than 50 pounds are rare. Habitat: River mouths, small, shallow bays and estuaries, and along rocky shorelines and sandy beaches. Food value: Stripers have a mild, flaky flesh that is delicious almost any way you prepare it. Description: Bluefish are colored blue or greenish blue on back and have silvery sides and large mouths with prominent sharp teeth. Size: Bluefish rarely exceed 20 lbs. and 40". The Mass. record is 27 lbs, 4 oz. Range: Along the western Atlantic, Blues are abundant from Argentina to Maine. Habitat: Bluefish inhabit both inshore and offshore areas of coastal regions, with baby Blues often frequenting estuaries and river mouths. Food value: Bluefish is excellent when grilled, sauteed or baked. Description: Bonito are shaped like a small tuna, steely blue above with silvery lower part and the upper part has 7 to 20 narrow dark bluish bands. Size: The bonito grows to 36 inches and a weight of 10 to 12 pounds. Range: Warmer parts of the Atlantic, north to outer Nova Scotia on the American coast and to Scandinavia on the European coast. Habitat: The bonito inhabits the open sea and travels in schools. Food value: The bonito is a good food fish. Description: Albies have a tuna-shaped body with a steel blue to dark blue color and a patch of wavy lines on the rear part of the back. The belly is very white. Size: Little Tunny are common anywhere from 2 to 15 pounds and can reach up to 30 pounds. Range: In the western Atlantic Ocean, it ranges from Massachusetts south to Brazil, including the Gulf of Mexico, Caribbean Sea, and Bermuda. Habitat: Little tunny can reside in both inshore bays and reefs and offshore. Generally, they are found in waters up to about 500 feet deep. Food value: Better than its reputation, but because of the very red flesh, they are seldom eaten. Description: The body of the Sand Lance is olive, brownish, or bluish green on top with silvery sides and a white belly and they are long and thin. Size: Generally two to nine inches. Range: In the northwest Atlantic they extend north from Cape Hatteras to Labrador, Hudson's Bay and West Greenland. Habitat: They are restricted to shallow water, generally along the coast or to the tops of offshore banks, and to sand or light-gravel bottom. Food value: Typically only for bait. 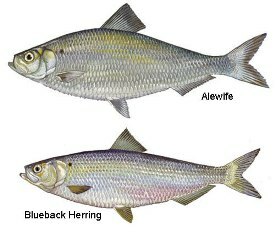 Description: Blueback Herring and Alewife are almost identical looking. Bluebacks are bluish along the back with a silvery head and the Alewife is grayish-blue above with a bronze head. Size: Maximum length is 12 to 15 inches and less than 1 lb. Range: Alewife range from Newfoundland to South Carolina, but are most abundant in the mid-Atlantic and northeastern states. Blueback Herring most numerous from Chesapeake Bay south. Habitat: Both Blueback and Alewife live in salt and brackish marine areas as adults and return to freshwater to spawn. Food value: River Herring are considered to be an important forage base for Striped Bass and Bluefish. Description: American Shad are slender and silvery-colored with a blue-green metallic hue on the back. Size: American shad adults are usually 18-20 inches long and weigh from 3-6 lbs and can live up to 13 years. Range: Along the Atlantic coast from Newfoundland to Florida. Habitat: Juveniles will school in estuaries and rivers; adults live in coastal waters. Food value: Eaten pan-fried, broiled, and baked. The roe is esteemed. Description: Menhaden are dark blue, green, blue gray, or blue brown above, with silvery sides, belly, and fins, and with a strong yellow or brassy luster. Size: Menhaden grow up to a foot in length and live about five years. Range: Coastal waters along the Atlantic coast of North America from Nova Scotia to eastern Florida. Habitat: Generally near the surface in brackish marine areas of the Atlantic Ocean. Food value: A bony, oily and inedible member of the herring family, but Stripers love them. Description: The Hichory Shad is silver-sided with grayish-green back and a prominent dark spot, followed by a row of lighter spots. Size: Hickory Shad are smaller than American shad, but larger than alewife and blueback herring. Range: Atlantic coast of North America from the Bay of Fundy to Florida. Habitat: Hickory shad are anadromous fish which spend the majority of their life at sea and only enter freshwater in the spring to spawn. Food value: Hickory shad taken commercially is usually sold principally for bait or for its roe (eggs), but some are salted, smoked, and pickled. Description: Fluke have both eyes on the left side of the body with the dorsal fin up. The eyed side is scattered with 10 to 14 eye-like spots which blend in with the ocean floor. Its belly is white. Size: Fluke average between 3-6 pounds and 15-22 inches long. Range: They range from Nova Scotia to Florida and are most abundant from Cape Cod to Cape Fear, North Carolina. Habitat: Summer flounder inhabit inshore areas and prefer eelgrass beds and wharf pilings because of the protection they offer. Food value: The white flaky meat of the summer flounder is highly rated due to its delicate flavor and texture. Size: Winter flounder normally grow to about 18 inches and two pounds. Range: It ranges from Labrador to the waters of Georgia and is most abundant from the gulf of St. Lawrence to the Chesapeake Bay. Habitat: Adults occupy bottom habitats in inshore bays and estuaries during the winter and deeper water in the summer. Food value: The nickname "lemon sole" says it all. Winter flounder are one of the five flounders most commonly found on dinner tables. Description: Atlantic Mackerel have silver underparts and metallic green and blue upper parts with irregular bands along the back. Size: Maximum observed size in recent years is about 16.5 inches in length and 2.2 lb in weight. Maximum age is about 20 years. Range: Inhabits the north Atlantic, the Baltic, Mediterranean and Black Seas. Along the Atlantic coast it is found from Labrador to Cape Lookout. Habitat: Atlantic Mackerel are most abundant in cold and temperate shelf areas. Food value: Atlantic mackerel are sought after for food either cooked or as sashimi and has a strong taste. Description: Northern Kingfish are part of the Drum family with dark, irregular bars present along the body of the fish. The first two bars form two distinct V-shapes. Size: Commonly Kingfish range from 10 to 14 inches long and weigh from one-half to 1.5 pounds. Range: Northern kingfish are found in the Atlantic Ocean from Maine to Florida and in the Gulf of Mexico from Florida to Yucatan. They are most commonly found from the Chesapeake Bay to New York. Habitat: Occurs usually in shallow coastal waters over sand to sandy mud bottoms. Common in the surf zone and in estuaries. Food value: This was the most favorite eating fish of my (striperjunkie's) parents - better than Striped Bass. My dad and I used to catch them from jetties near Point Lookout. Description: The Scup is a silvery fish with strong dorsal spine and is about one-half as deep as it is long, and very thin. Size: The scup may reach a length of 18 inches and a weight of 3 to 4 pounds, but adults are typically 12 to 14 inches, and 1 to 2 pounds. Range: East coast of the United States, from North Carolina to Cape Cod. 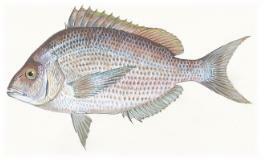 Habitat: Scup are inshore from early April at the mouth of the Chesapeake Bay, and from early May northward to southern Massachusetts. Food value: Scup are a common angled fish and are good to eat. Description: The Weakfish's head and back is dark brown in color with a greenish tinge. The sides have a faint silvery hue with dusky specks, and the belly is white. Size: The weakfish can grow to 3 feet in length and 20 pounds in weight. Range: Weakfish are distributed from Florida to Massachusetts Bay and sometimes to Nova Scotia. Habitat: Weakfish move in schools and inhabits shallow waters, preferring sandy and muddy bottoms. Food value: They are quick to mature and highly prized for their their taste by seafood lovers. Description: Atlantic Cod are brown to green or gray on the dorsal side and flanks, with a pale ventral side and smooth, small scales. Size: Off shore cod often reach 25 pounds and 40 to 42 inches while the inshore cod usually weigh 6 to 12 pounds and measure 27 to 34 inches. Range: Cod are distributed in the Northwest Atlantic from Greenland to North Carolina The Northeast Atlantic is the world's largest population of cod. Habitat: Atlantic Cod are found in temperate climes ranging from the shallows near the shore to deeper waters near the continental shelf. Food value: Atlantic Cod is one of the most popular food fish in the western world. Description: Tautog are brown and dark olive, with white blotches, and have plump elongated bodies. Size: They have an average weight of 1 to 3 lbs and reach a maximum size of 3 feet and 25 lbs. Range: They range from the outer coast of Nova Scotia to South Carolina, most abundant between Cape Cod and the Delaware Capes. Habitat: They prefer steep, rocky shores; around breakwaters, off lying edges, and submerged wrecks; around piers and docks. Food value: The tautog has always been a favorite table fish, as its flesh is white, dry, and has a delicate flavor.